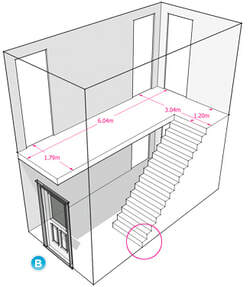 This is a quick guide to enable you to measure a room for your chosen flooring. Measuring your room can seem daunting but it really needn't be. Follow our simple how to measure your room guides and you'll be an expert in no time! When measuring your rooms you should always ensure that you keep the flooring running in the same direction to maintain texture, pattern and colour consistency. ​If you change the direction then the pattern, texture and the pile of the carpet will reflect the light differently. ​Once all measurements have been taken you can plan what you need to buy taking into account the width of carpet you wish to purchase. In the event that the width of the hallway or landing is greater than the width of the available flooring then you will need to include a join. This area can be used as an infill from excess from the other areas if available.